However, Apple Pay created the biggest buzz during Tuesday’s media event. With this program, users can scan from MasterCard, Visa or American Express and upload information from the cards onto the Passbook app. The app then assigns a unique token that can only be used by that specific device. Apple Pay creators hope this will be both an easier and more secure way to shop. Read more about this new technology. Do you think it will catch on with other card companies, consumers and merchants? 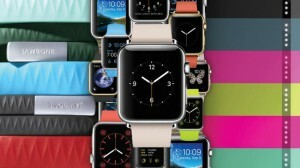 Finally, Apple is breaking in to the world of wearable technology with its Apple Watch. The Apple Watch is designed to work with an iPhone 6 or even a model as late as the iPhone 5. It can text and call by use of its touchscreen face. The watch can measure its wearer’s heartbeat and health and fitness, carries GPS and Wi-Fi from the user’s iPhone and can hold a score of other apps. This product is not due to hit the consumer market until 2015 when Apple users are already comfortable with their latest iPhones. Can you see wearable technology taking off? Or is it simply a niche market? Even with all of Apple’s user-friendly technology and slick functionality, Android users, for the most part, remain faithful to their operating systems. The’s also no doubt other companies will respond with product advancements in the wake of these new products. They may even shave a few rough edges off of Apple’s initial design. Will you be in line for a new iPhone next week? Or will you wait to see what hits the market next?